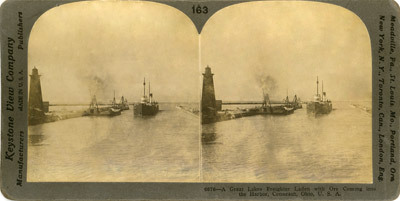 A Great Lakes Freighter Laden with Ore Coming into the Harbor, Conneaut, Ohio, U.S.A.
Stereoview of a laker with a load of iron ore steaming into Conneaut, OH past dredges and a dump barge and the old Conneaut lighthouse. The piers of the new harbor can be seen beyond the current piers. 6676 -- A Great Lakes Freighter Laden with Ore Coming into the Harbor, Conneaut, Ohio, U.S.A.
Meadville, Pa., St. Louis, Mo., Portland, Ore., New York, N.Y., Toronto, Can., London, Eng. 6676 -- A Great Lakes Freighter Coming Into Harbor. The smaller ore boats carry about 3,000 tons of ore while the largest carry more than 12,000 tons. The one shown in this view is a medium-sized boat and may be carrying 5,000 tons. The view is to the north across Lake Erie. On the west side of the harbor are two lighthouses. These are range lights. They are placed on the west side of all Lake Erie harbors. At night the boat must get in line or in range with these two lights while yet several miles from shore. Then by keeping in range with them it is sure to make the harbor. The report of the collector of the U.S. Customs shows that 1362 vessels entered Conneaut Harbor during 1904. The receipts were 4,038,755 tons or iron ore, 52,104 tons of pier stone; and 458 tons of other freight. This was more iron ore than received at any other port on the Great Lakes. The iron ore receipts for 1905 will probably be 5,250,000 tons, but Ashtabula, Ohio, will receive somewhat more than Conneaut this season. The shipments from Conneaut Harbor for 1904 amounted to but 413,320 tons, 98 per cent. of which was coal, and one-third of this coal was used as fuel on the boats. The receipts and shipments mentioned concerned domestic commerce only. The imports for 1904 were valued at %53,216. They were mainly lumber. The exports were valued at $3,774,562, of which about 15 per cent. was bituminous coal and nearly 85 per cent. steel rails and other forms of manufactured steel. The foreign commerce was wholly with Canada. Copyright 1905 by Keystone View Company.